Fashion, Well Done: DON'T WAIT UP! I'm completely running out of outfit posts - I work from home as a freelance writer, so most of the time I'm tramping it up in my pyjamas or sporting a rather shameful pair of joggers! But at least I can say I do try to make the effort when I head out - I don't want you guys thinking I am a horrible slob (although on a Sunday evening that is exactly what I am). 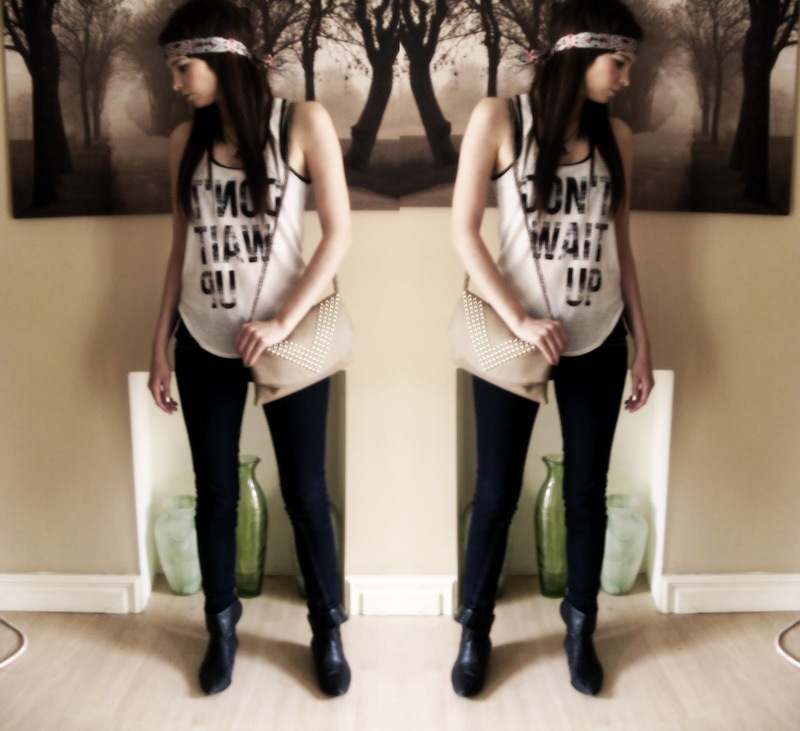 Printed Tank, Miss Selfridge - similar here. Skinny Jeans, Primark - similar here. Pixie Boots, Ebay - similar here. Neckerchief (as headband), Topman - similar here. Studded Bag, Thrifted - similar here. Cassette Necklace, Punky Pins - same here. Have any of you guys been trying out any new styles that aren't your norm? I could also do with some suggestions of what to wear to a wedding party - I'm totally stumped, the last wedding I went to I felt unbelievably overdressed, which led to a rather strange woman following me to the toilet and saying I looked like I belonged in Closer magazine - I wasn't sure if that was a compliment or not! That's so sweet of your boyfriend- he had amazing taste. I know what you mean about slob clothes- I have to we're a very stuffy uniform so when I get home it's straight into the leggings and knitwere for me. thank you for the comment on my blog- you should give diy a chance, the mistakes make it more fun. If I'm at home doing nothing I'm inclined to wear old jeans and a t shirt but then I have to do the school run and I don't want to look like a frumpy housewife. I have started to really dress up. I went on a course last week and wore a 50's style scarlet dress and red shoes with black tights. Everyone else was in black trousers and Next blouses. I didn't care that I was a bit ovrrdressed, I made an impression and got extra freebies from the drugs rep. Your boyfriend has great taste. Hang on to him! Your 50's style outfit sounds amazing - so glam and ladylike! I'm definitely not letting him go anywhere! Thanks girl - thats really kind of you! love that headband, a sweet gift. If you can't dress up to a wedding then where can you, I ask? If the other guests haven't bothered then that's their bad. Ha. Thanks Soph, think I'm going for a 70's inspired maxi dress - need a bit of comfort as I am well under the weather - boo! I love your outfit, especially the necklace - Punky Pins is the best! I wore a maxi dress for the first time the other day for a photoshoot and I was pretty dubious at first but I ended up loving how it looked, it's great to move out of your fashion comfort zone! I do love Punky Pins, my name necklace broke so I need to get some superglue asap to get it fixed! Maxi dresses are fab - the ultimate in style and comfort! Well I wore a 70's inspired maxi dress - but when I got there someone had the same dress on as me - luckily I think I looked better in it! That a sweet gift from your other half and it looks great. I'm always feeling over dressed especially at work. But I'd rather feel smart than scruff so I don't mind. To be fair though I do wear scruffs when I'm just slobbing out at home. As long as no one will see me of course. 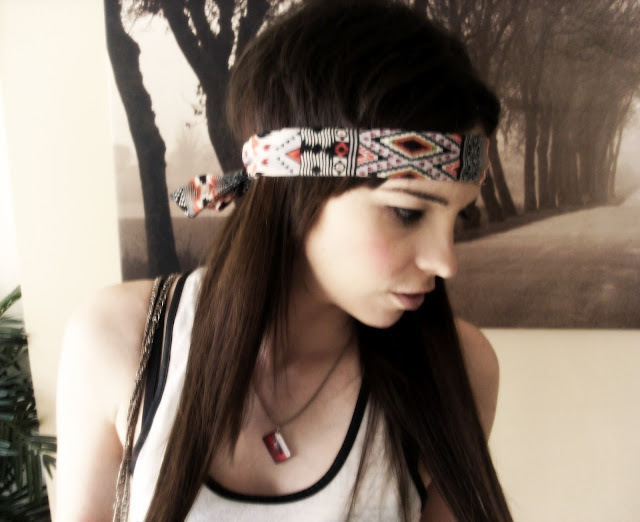 I do love my new headband, it was proper thoughtful. I'm in my scruffs today, its raining and I don't want to go anywhere! Love the top :) Your bag is pretty too! The bag was a bargain £2 from a charity shop - well pleased I was! Yeah he's a good one really! Thanks Polly - both were great bargains! 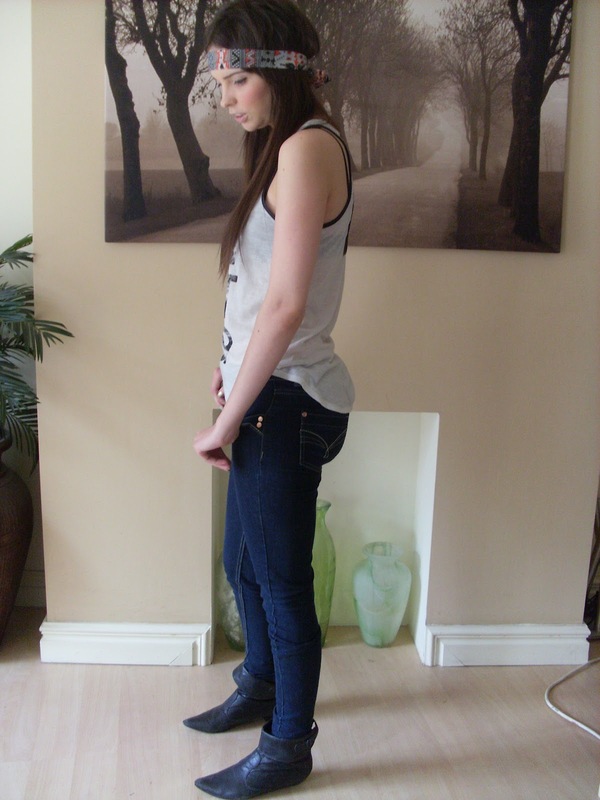 loving the vest - check out the New look giveaway on my blog its a goodun! Love the headband - I swear I have dozens of these at home (in fact most of them are thrifted scarves) and never wear them, and I just think you've inspired me to do so! I have found that they are great for windy days, when hair is bound to go all over the place - Headband on, problem solved! I love the way you styled and accessorised this outfit especially the headband. My hair can be so fly-away so headbands are great for keeping it pinned down when it is windy to stop the dreaded hair stuck to lipgloss situation!